We’re warming up for The Allure of the Auto, which opens March 21. ASIFA (Association International du Film d’Animation), is the worldwide animation society founded in Annecy, France. ASIFA was established in 1960 b y many great masters of animation in the spirit of pursuing world peace, and aiming to promote friendship and mutual understanding between different cultures through the development of our unique art medium — animation. This precious spirit of our founders, who include Paul Grimault, Lev Atamanov, Norman McLaren, John Hubley, Ivan Ivanov Vano, Karel Zeman and Alexandre Alexeieff among others, continues to guide our activities. Today, there are more than 30 chapters all over the world, including ours right here in Atlanta, which promote the art of animation through workshops and screenings. In recognition of Emile Reynaud’s first public performance of animation by Theatre Optique at the Grevin Museum in Paris on October 28th, 1892, we celebrate International Animation Day. This year is the fourth time ASIFA-Atlanta has celebrated IAD, and the third time we’ve presented films at the High Museum of Art. Last year, about 40 different countries spanning every continent celebrated International Animation Day, some of them extending the celebration over days or weeks of screenings and workshops. So far this year, so far we’ve received films from Japan, Korea, Brazil, India and Croatia. We hope to also show films from Portugal, Russia and Bosnia via a DVD exchange made possible by ASIFA. Chapters compile a DVD of selected films from their members and send it out to other ASIFA chapters around the world. 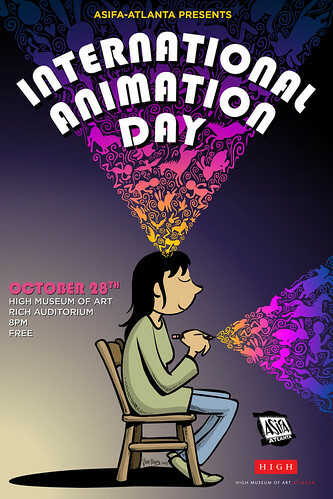 This year marks our first International Animation Day screening the Woodruff Arts Center’s Rich Theatre. ASIFA sponsored a great event there this past July for the Society for Animation Studies conference and fell in love with the space. With a seating capacity of 400, we expect a large crowd of animation lovers. It’s free to attend. Reserve your ticket at asifa-atlanta.com. Our thanks go out to ASIFA-Atlanta members, whose participation and membership fees make this all possible. Please check out our website at asifa-atlanta.com if you’d like keep up with our events or if you’d like to join ASIFA-Atlanta.